By forcing bulbs you easily create a pot of brightly colored tulips, a basket of daffodils or plumb hyacinth bulb sprouting from an elegant vase. A cheerful sight in the late winter months, reminding us that spring is not so far away. Bringing bulbs indoors and 'tricking' them into flowering early is referred to as 'forcing'. To get bulbs to bloom out of season, most need some kind of conditioning, such as leaving them in a dark, cool spot for a certain length of time. Classic spring flowering bulbs, such as tulips, crocus and daffodils need a little special treatment, but the results are worth the effort. Bulbs that need no special treatment are paperwhite narcissus and amaryllis. Buy these in shops or garden centers a few weeks prior to the holidays. Some varieties of colchicum will also bloom without conditioning. These bulbs can simply be potted up, watered, and placed in a bright location to grow and bloom! 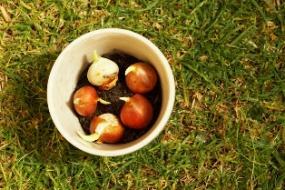 Plant several bulbs tip-up in a fast draining potting soil mix. Plant them 2" apart or so, and deep enough so their noses are covered. Water thoroughly. If you plant tulip bulbs, position them with the flat side of the bulb against the side of the pot- this is where the largest leaf with unfurl, and it will then hang over the pot nicely. Now condition, or "chill", your bulbs. Put your pot of forcing bulbs in a cool, dark place. Around 40 F is perfect. Don't let them freeze. An unheated basement or attached garage is good. The refrigerator is ok, but not if fruits are stored there too- the ethylene gas from ripening fruit can disrupt flower bud development. In mild climates, the potted bulbs can be kept outdoors in a trench in the ground covered with mulch, or another protected location away from rodents. Keep the soil slightly moist but not soggy. Don't let the bulbs dry out all the way. You'll probably have to check on them and water just a few times while they are being chilled. Mark on your calendar when it's time to check on them. Wait for 14-16 weeks, depending on the type of bulb. You can check them as the time gets close to see if they are sprouting or roots are coming out of the bottom of the pot. If so, bring them out into the light, if not, just bring them out when the time is up. Put the pot of bulbs in a bright, warm spot. A south- or west-facing window is best. Give the pot a quarter turn every day so the flowers grow evenly. Water them enough to keep the soil slightly moist. Feed with organic bulb food if desired. After about three weeks in the light the plants will bloom. To help the flowers last longer, put the pot in a cool spot at night or when you're away, as heat makes them grow faster. After the bulbs are done blooming you can compost them, or save them and plant them in the garden in spring if they are hardy in your zone. It might take a few seasons for them to get back on schedule. Different bulbs take various amounts of time to form flower buds. Here are guidelines for the most common bulbs. Tulips-A huge variety of colors and flower shapes available for bold or elegant displays. Narcissi-Fragrant and cheerful, choose from miniature jonquils, bicolored or classic daffodill types. Crocus-Bright orange stamens contrast with purple, lavender, yellow or white petals. Muscari-Grape hyacinth. Sweet smelling clusters of purple or blue flowers. These bulbs are also suitable for growing as indoor decorative plants as described above. Consider planting one type of flower per pot and grouping several pots together for more color. Frittilaria-Checker lily, nodding purple or white flowers with an interesting pattern. Hyacinth-Very fragrant blooms in blue, yellow, pink or purple. Dutch iris-Purple, blue and yellow flowers with simple, pointed leaves.